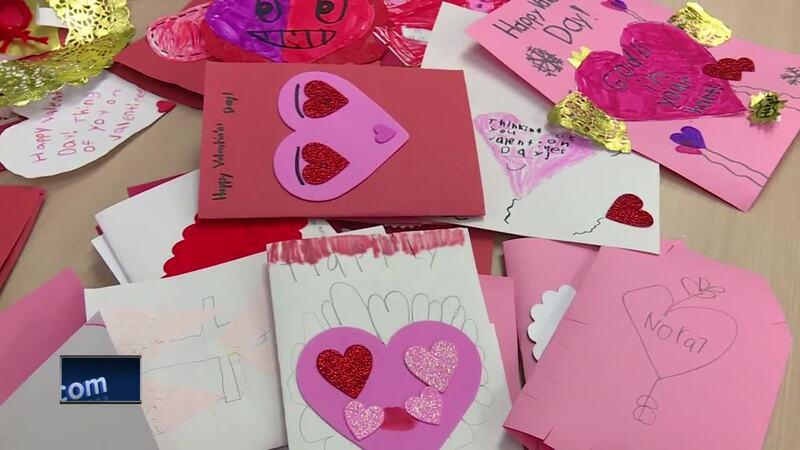 APPLETON, Wis. — On a drive home one night recently, Bev Caron asked her 7-year-old son what type of valentines he wanted to give his classmates this year. His answer wasn't what she expected. "It kind of came out of nowhere, and I just love his excitement for it," she said. Logan told his mom that his focus isn't on his peers this year. He wants to bring joy to senior citizens living in nursing homes. "They don't get cards, Valentine's Day cards," he explained. Bev said, "He started talking about a project of having people bring cards that he could hand out to people who don't get them otherwise, so it just kind of went from there." Logan enlisted the help of fellow students at Xavier Elementary School in Appleton. They used colored paper, glue, markers and other supplies to create messages of love. "I wrote, 'This Valentine's Day you will come into my heart and never come out,'" second grader Gabby Condon recalled. The children want to remind the seniors that they aren't forgotten. "I like making cards for people because I bring joy into their heart," explained Nicky Schnaubert. "They've put a lot of time and thought into these cards, a lot of homemade cards with fingerprints and handprints," said Bev. After posting about the project on Facebook, as well as setting out a collection box at church, Logan crushed his initial goal of 100 cards. "We have at this point 350 cards," and Bev said they just keep coming in. "He has cards coming from Virginia, Pennsylvania, Iowa and here in Wisconsin." Everyone was surprised by the huge response, but not by Logan's actions. "He's got a very kind heart, very loving boy. To do something like this I think is just a feather in his cap," said Logan's teacher, Ellen Baisden. Bev added, "It reaffirms the things that you've done at home. You hope that your child is going to behave and make a difference, and then when they come up with something like this completely on their own, it reaffirms that." Logan plans to hand deliver all the valentines. "Because it will make people happy," he explained. Baisden knows that first-hand after visiting her mother who lived in a nursing home. "I've seen people who are by themselves day after day after day. Just one kind word, one smile, and one card now will really, really make their day." Bev works in hospice and has also seen the impact. "Most of the elderly patients I know have been overjoyed to see kids come and visit. So to have the visit and a card, I think will be really cool for everybody." It will be especially neat for Logan who spearheaded it all. "I'm very proud of him," Bev beamed. Logan has a goal of collecting 500 cards. If you'd like to create your own cards for his project, you have until February 11th to drop them off at St. Thomas More Catholic Church in Appleton.